Grandmaster Garry Kasparov, from left, with Grandmaster Wesley So, winner of the 2016 Sinquefield Cup, and Jeanne and Rex Sinquefield. 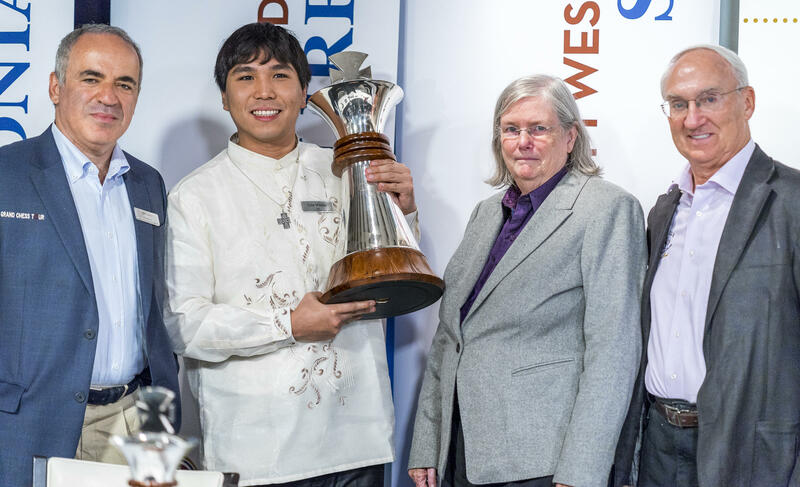 Former Webster University student Grandmaster Wesley So stood atop the leaderboard with a draw in the final round, but was forced to wait anxiously for the conclusion of the tournament’s final game between Grandmasters Veselin Topalov and Levon Aronian; either of whom could have caught So to force a playoff if he managed to win. A back-and-forth affair, the game’s outcome came down to the final pawns. When the smoke cleared, a mutual truce was all that remained. So had won his first-ever major international tournament. After the quick-paced rapid and blitz events in France and Belgium, the Sinquefield Cup marked a return to classical time controls, resulting in some of the highest-quality chess. The players were able to think through potential pitfalls and wiggle out of difficult positions. 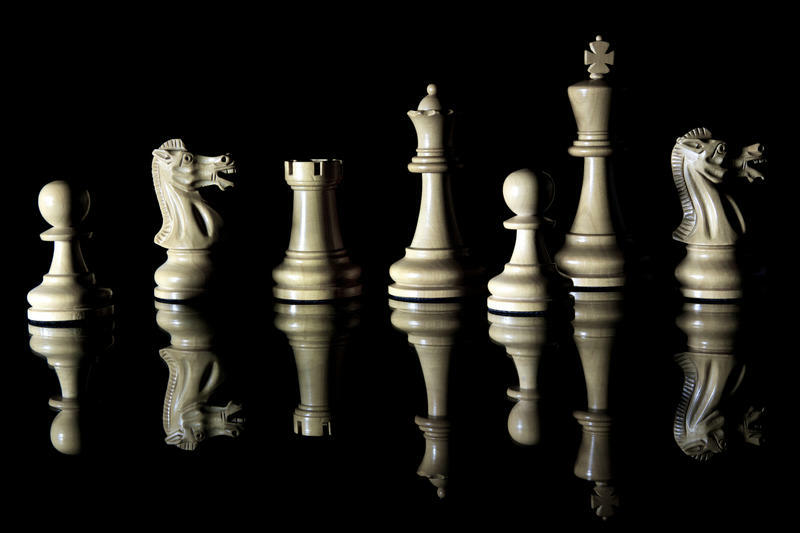 Additionally, classical chess allows the players to demonstrate new ideas in known positions and introduce deep concepts throughout the game, further enriching the experience. Going into the tournament, Americans Hikaru Nakamura and Wesley So were leading the Grand Chess Tour with 17 points each. Nakamura had an impressive showing in Paris, winning the event ahead of World Champion Magnus Carlsen, but followed it with a poor performance in Leuven, Belgium. So kept pace with a solid performance, finishing second and fourth in the faster time control events. Picking a clear favorite to win the Sinquefield Cup was not easy. Some of the players were coming off of great performances, while others were eager to improve on their previous, poor performances. Readers may recall So’s last-place result last year. At the opening ceremony, the players were asked who they would choose as the favorite. The general consensus was that newly crowned No. 2 player in the world, Maxime Vachier-Lagrave, was the most dangerous. Vachier-Lagrave had a very successful year, gaining roughly 100 rating points to cement his place on the leaderboard. However, as more than one player opined, when all the top players are in a tournament, anyone who is in good form can win the event. Wesley So’s strategy of “slow and steady wins the race” worked perfectly. He did not thrill with brilliant attacking games like Nakamura, nor did he slug it out in 7-hour marathons like his other countryman, Fabiano Caruana. Instead, So demonstrated a zen-like focus, making draws when he needed to and defeating his closest rival, GM Nakamura, when it counted. Drawing seven of his games, So’s two victories were enough to secure top honors. The burden was always on his opposition to catch him as the field remained tightly bunched. Every chess player knows that a little bit of luck is needed to win an event like this, which So recognized in his remarks at the closing ceremony. Ding Liren, China’s highest rated player, gave away his big advantage in one move, allowing So to draw. Veselin Topalov gifted their game to So after making some questionable decisions during the matchup. With a wink in his eye, So thanked his opponents for his victory. For his efforts, So was awarded $75,000 and 13 Grand Chess Tour points, earning a bonus point for finishing in clear first place. The American now leads the tour and is in good position to win the overall $100,000 bonus. What a great year it has been for America’s No. 3 player! The 2016 Grand Chess Tour will conclude in London this December. England’s best, GM Michael Adams, will join the nine tour players as the wild card. 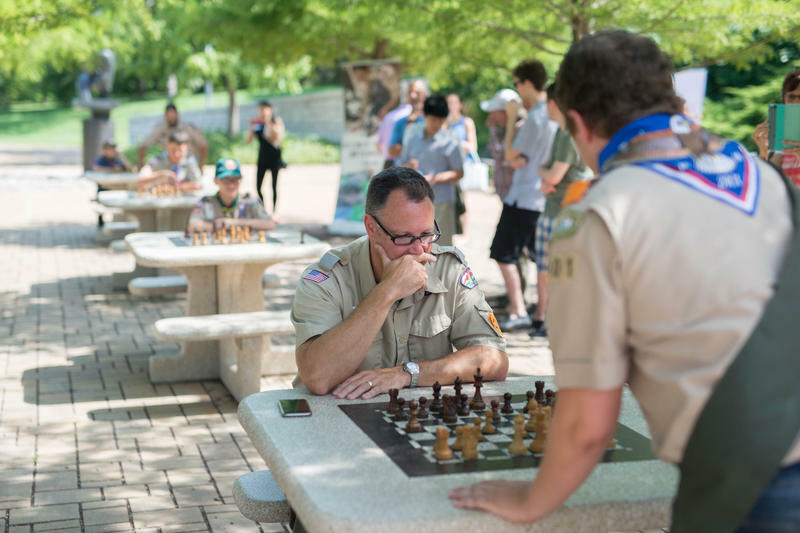 Adams is no stranger to elite chess, and he will certainly pose some problems for his opposition. However, just as it was during the Sinquefield Cup, the burden will be on the rest of the field to try to catch Wesley So. Will he stick with slow-and-steady or mix things up for London? Either way, one thing we know for sure: The Grand Chess Tour has set the gold standard for players and fans alike. Tatev Abrahamyan, WGW, started playing chess at 8 after her father took her to the 1996 Chess Olympiad in Yerevan, Armenia. There she met Grandmaster Judit Polgar, arguably the greatest female player of all time and the only woman in the tournament. Currently the third highest rated female in the U.S., Abrahamyan has represented the United States in four Olympiads and two World Team Championships since 2008.